It is that time of the month again to look at the performances of players throughout the league and determine who is the Baller of the Month. 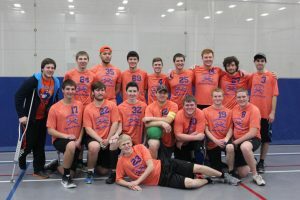 The board looked at various criteria and a number of deserving players and the content team decided on University of Wisconsin- Platteville’s very own Will Martin. Will Martin is #23, the one in the front. Here is what a few former Platteville players had to say about Will Martin as a player. 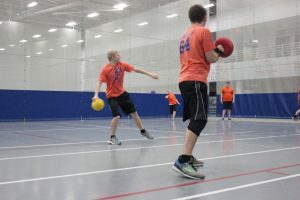 Matt Batuch- Ever since Will started playing dodgeball he seemed to be a very quiet kid that you didn’t think you would have to worry about, but that wasn’t the case. 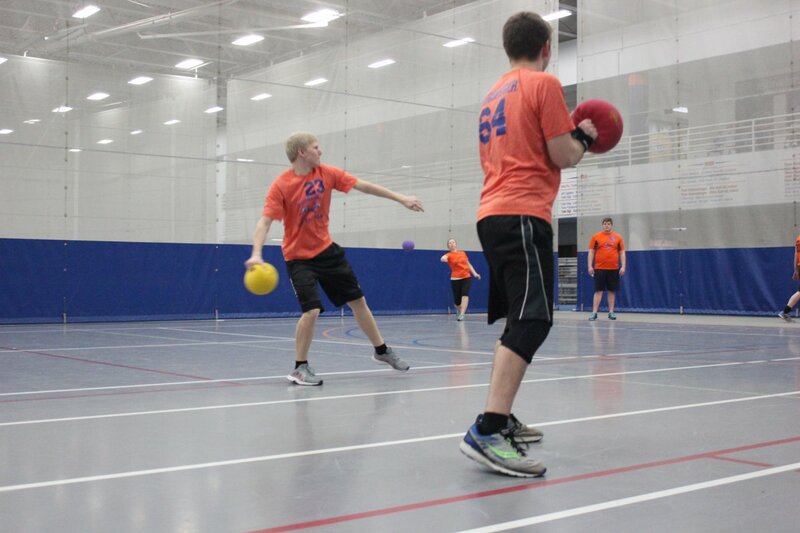 Will’s dodgeball skills picked up quickly and he definitely was someone you had to watch out for on the court. If you are not paying attention, expect a ball coming your way. 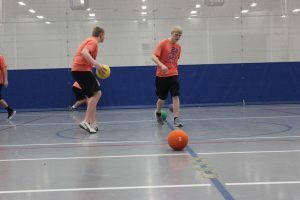 Will has done an excellent job taking over the dodgeball team this year, and has set up the club for success in the future. Nick Harding- Will Martin is a team player and great strategist. Will is dependable in any role and leads from the front. He can always be counted on to do the right things at the right time. We have heard from others about him as a player, so now let’s hear from him. The following was the conversation the content team had with Will. Erik Zander- How does it feel to be Baller of the Month? players in this league and to be singled out as one of them is really amazing. I’m so thankful for all my teammates that have helped me get to where I am now, they make me look a lot better than I really am. Right at this moment Will is thinking this. That ball looks really interesting. I wonder where it came from? Hunter Ford- Boxers or Briefs? WM- Boxer-Briefs. Security and comfort. Kevin Bailey– Chipotle or Qdoba? WM- I feel bad about this one because I’ve never been to Qdoba. I do like Chipotle though. Colby Briceland– Biggest Athletic influence, could be professional or someone you know personally (Kevin suggested Jesus or Erik)? WM- I try to live my whole life, including athletics, in a way that will bring glory to my lord and savior Jesus Christ. And, of course, Erik Zander has been huge in helping me learn the game. WM- Matt Bautch was definitely a stud while at Platteville. I learned a lot of the things I do now from him. That being said, obviously the correct answer is Aaron Rodgers. He’s got a cannon and would be awesome at dodgeball. KB- What are your thoughts on playing in the Midway Conference, the pros and cons? There is the wind up, did he hit someone? I’ll let you be the judge. WM- The cons are fairly obvious; we have to travel a long way to get to anyone, and there aren’t a lot of competitive teams here right now. As for the pros, I think it has been, and will continue to be, really exciting to see the development of the league in this region. In Platteville, we have had the chance to reach out to some of the new teams, which has been really fun. Also, we have DePaul, and DePaul is awesome! EZ- How do you handle the pressure of dealing with me all the time? WM- Sometimes you’ll be telling me something and I’ll zone out and just nod as if I’m listening. I think that helps (EZ- I can confirm this does happen). EZ- What are you looking for at Nationals for yourself as well as for your team? WM- I’ll be looking for consistency from myself. I faded down the stretch last year, and let some of my teammates down. This year I want to be able to play as well in the last game as I do in the first. I’d like to see my team play with the highest level of sportsmanship, work together, and focus on the the things we have been practicing. We have a lot of young guys and I have been amazed by what I’ve seen from them. If they can put all the things that they have learned together, then we’ll be able to do some damage at Nationals. EZ– What is one player in the league that you have heard of that you would like to call an ISO in a game against? WM– There isn’t a player in the league that I wouldn’t love to call an ISO on. I’d go myself versus all of CMU for all I care. Prerequisite for ISO with me: Be alright with being embarrassed by someone who looks weak. EZ– Any other interesting thoughts that you would like to tell me or the league? WM– Nah, just that I want to wish everyone good luck at Nationals. Hopefully, the injuries this year are minimal, and everyone has a good time.